Government backs hydrogen power | What Car? Hydrogen fuel-cell technology received a boost today, as business minister Mark Prisk revealed a Government-backed programme to help British car makers bring hydrogen vehicles to market. The UK H2Mobility scheme brings together 13 partners to solve the 'serious technical and commercial barriers to bringing these technologies to market' and has set itself the target of producing a timetable for development by the end of 2012. 'It requires that the whole of Whitehall be coordinated to deliver these goals', said Prisk, announcing an initial 7.5m of funding. The UK currently has hydrogen fuelling stations in Birmingham, London, Loughborough, South Wales and Swindon. There are plans to manufacture hydrogen at nuclear power plants, but all the current supply is produced from natural gas, and this is the official method for the launch of the UK H2Mobility programme. 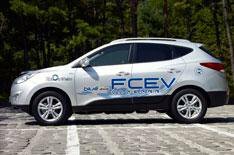 Hydrogen fuel-cell vehicles are powered by an electric motor, which gets its charge from hydrogen fuel cells. The only tailpipe emission is water vapour.